The universe we live in has a hierarchy of structure. We live on a planet which orbits an averaged sized star that we call the Sun. The Sun has neighbouring stars which all form into a large galactic city that we call the Milky Way. Each of these galaxies is gravitationally combined with all the other neighbouring galaxies into the Local Group. The Local Group is moving toward an even larger structure of galaxies called the Laniakea supercluster. These galaxy clusters as the Cosmic Giants which are the largest structures in the Universe. These are nodes between the thread in our vast and maybe infinite cosmic web. 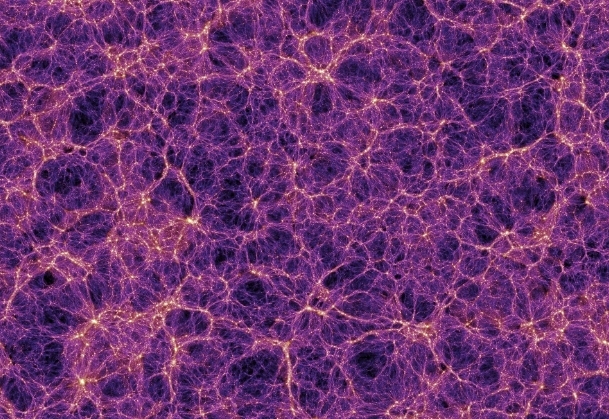 An image taken from the Millennium Simulation of Dark Matter particles it displays the Cosmic Web in the Universe. In the early moments of the 20th century a young German physicist working in a patent office released a paper which described the way that light works dependent on observer. Albert Einstein’s Special Relativity described a new way of thinking about the world. One in which time and space were not fixed for everyone and even the order of events could be different for those who observe from far enough apart. It was only 10 years from Special Relativity until Einstein went one step further and redesigned the way we think of the most fundamental building block of the Universe, gravity. From the time that the metaphorical “apple” fell on Issac Newton’s head, scientists thought that gravity was an invisible force that just acted between objects with mass. Now Einstein was saying that space and time are one 4 dimensional sheet that mass warps. The idea was met by criticism from many, however it was a British astronomer Arthur Eddington who designed an experiment to test Einstein’s theory. Indeed the story is one which just shows how scientific discovery can transcend war (If you are interested further please watch the movie Einstein and Eddington <- linked here). He showed that by using the total solar eclipse you can see that the mass of the Sun bends space-time in such a way as to shift the background stars by a fraction. Although when these preliminary results are reviewed they would seem dubious by today’s standards, over the last 100 years this theory has been challenged multiple times and has always come out on top. It is this theory which allows us to measure our cosmic giants. Much like Eddington observing the curvature of space-time by the Sun we now must observe the same effect but of Galaxy Clusters. The principle is that light always travels in a straight line. But this only hold through space-time, by bending the fabric we appear to bend the path of the light. Strangely this can be seen! When observing many clusters we see that the curving of space-time produces lensing of background galaxies around the centre of the cluster. The perfect example of gravitational lensing is if a background galaxy is exactly behind the cluster centre then a perfect Einstein ring is seen. 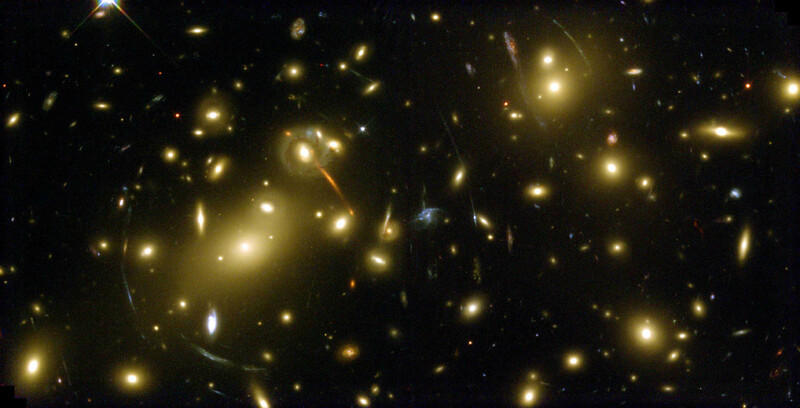 Below is an example of a galaxy cluster with gravitational lensing around the centre. The scale of the hard lensing seen above allows us to determine how much mass is located in the centre of the cluster. More recently a secondary and more powerful technique has also been developed. This involves measuring the weak lensing of very faint background galaxies further from the centre. The small shearing of the background galaxies also allows scientists to map the distribution of the mass within the cluster. As most of this mass is concentrated in the mysterious Dark Matter it gives astrophysicists a unique opportunity to map out the DM clumping. Looking forward to the future, by analysing a large number of galaxy clusters we will be able to determine the amount of Dark Energy in the Universe. Using simulations in which the contribution of accelerating Dark Energy is varied we see that the density of clusters varies proportionally. Over a large number of galaxy cluster we can measure this parameter and hence infer the amount of Dark Energy in the Universe. In the next decade the introduction of the new cluster surveying telescopes such as EUCLID will move us from an era of analysing tens of clusters at a time to measuring thousands. This will be a golden age for cluster lensing analysis and will move towards answering important questions about the structure and dark side of our universe. Welcome to the first of the Physics Horizon Spotlights, what better way to start than with the most accepted theory about how our Universe began! I will start by testing your brain to see whether you are superhuman, I ask you to close your eyes and imagine a zero dimensional space-time region, no space, no time! Now I would have thought about now you are probably thinking of a black empty void with nothing in it? This unfortunately, is as far as your brain will take you and unfortunately you failed the test! The Big Bang Theory (not the TV show) has its origin back in 1929 when Edwin Hubble began studying far away galaxies. He realised that outside of our Local Group of gravitationally bound galaxies, all others seemed to be moving away. What was more surprising still was in all directions the further the galaxies were away from us the faster they seemed to be moving away! He determined the galaxies movement by a property called the redshift, which as the name suggests is the shifting of the wavelength of light from the galaxy toward the redder end of the optical spectrum. A similar phenomenon known as the Doppler effect can be observed when you hear an ambulance pass you on the street. As the ambulance approaches the noise it makes appears higher, the sound waves are being squashed because of the movement. But after the ambulance passes you the noise appears lower as the sound waves are stretched. This idea can be used with light (electromagnetic) waves, such that if an object moves toward you then the waves are shifted to the bluer end of the spectrum and visa versa. This doesn’t seem very interesting a discovery at first however there is much to be found from this fundamental relationship. For those who have scientific backgrounds you may have noticed how the units of the Hubble constant has two distance units which with a bit of mathematical trickery can cancel out to give a constant which is in units of s^-1 alone. If the reciprocal of this constant is taken (1/HO) then the time you get from the equation is around 13.8 billion years which happens to be the current estimated age of the universe. So what happened all that time ago? 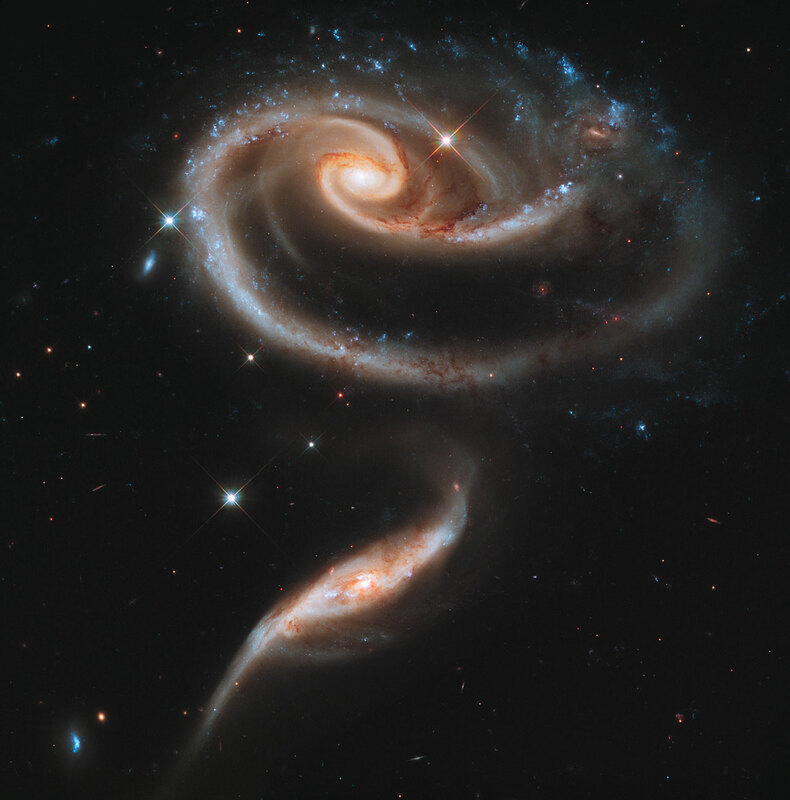 Well what we know so far is Hubble found everything was expanding and this itself was a large indicator that if the expansion of these galaxies was reversed then everything would converge on a single point. This early stage in the universe would have had everything close together having enormous pressure and temperature. But at the time of Hubble’s discovery there was another idea which had more grounding among the scientific community called Steady State Theory. This theory had a universe with an infinite age and size in which matter was continuously created and kept in a steady state. It took one last fundamental and accidental discovery for the Big Bang theory to be truly accepted. 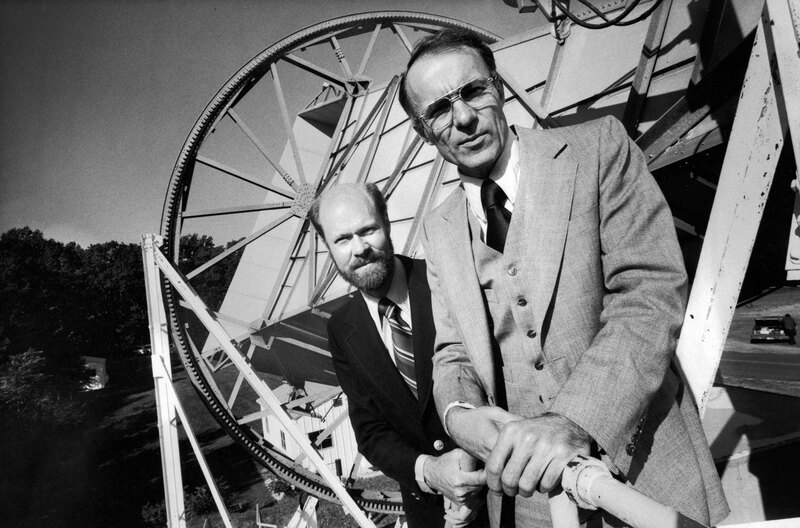 In 1964, Arno Penzias and Robert Wilson were setting up a sensitive horn antenna (see pic below) which was to be used to detect low level microwave signals. However when they turned this shiny new instrument on they were annoyed to see a dim buzzing of noise of such significance that they could not ignore it. They tried changing the direction of the antenna the noise persisted, they tried replacing all the wiring the noise persisted, they even cleaned all the bird droppings of the instrument but the noise still persisted. Eventually they realised that it must be an external source but that it was also uniform at all points in the sky. What they had actually found was radiation left over from a time shortly after the big bang called the era of recombination. Information regarding this era will come in a different spotlight but what is important was that this was a uniform noise from everywhere. Which means that the source of the noise must be coming from everywhere! Now imagine I have a really dense point with all the matter of the universe within it. As it expands all the points within this object were at this point at the beginning. It is a hard concept to grasp but with a little thought you will understand. 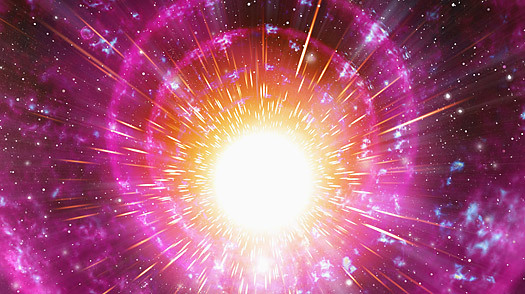 In the universe every point in space was at the big bang and has just expanded from there. This idea correlates exactly with the reading that Penzias and Wilson found and so the Big Bang theory was adopted as the origin of our universe (for now [you should never accept a theory as solid fact.. especially in the ever changing field of cosmology])! So lets go back to the beginning. Try again to imagine your zero dimensional region, then suddenly (and for as yet undetermined reasons) the universe sprung into existence as a infinitely dense, infinitely hot and infinitely small point. At this point most people may be thinking of a point from outside the universe a misleading idea because where you are doesn’t exist!! At any rate the universe begins to expand rapidly and as it does the pressure and temperature begin to drop as the volume increases. The fundamental building blocks of matter quarks and there anti-quark partners are created and destroyed rapidly in a plasma state. Another great mystery of why are universe consists of predominately matter crops up here, somehow there is a slight imbalance and quarks win out against antiquarks. This is all in the first 10^-37s. At around 10^-6s the baryons of protons and neutrons form and then after a few minutes when the temperature has fallen to a mere 1×10^9K [K stands for Kelvin and is the temperature scale from absolute zero (0oC=273K)] these protons and neutrons start to form into the lightest nuclei hydrogen and helium. A while now goes by… 379,000 years later the energetic electrons are ‘cool’ enough to form with the nuclei into the atoms we see today. Gravitational force takes over and 13.8 billion years later here you are the reading this article sitting on a rocky planet orbiting around a sun which itself moving around a galaxy with 300 billion other stars. This galaxy is caught in a gravitational dance with others in a Local group and this floating in the rest of the spiderweb network of galaxy clusters spreading out across an ever expansive universe. How strange to think that only a paragraph above we were a infinitely small point! I hope you have enjoyed reading about the Big Bang theory if you would like to comment or know more please just comment below. Watch out for more in the Physics Horizon Spotlight series!